You are currently browsing the tag archive for the ‘market’ tag. So, here we are in the final instalment of my ‘food memories’ of Greece. If you’ve not read the previous posts, you can read part 1 about our beautiful hotel Kinsterna, part 2 about our day trip to the island of Elafonisos, and part 3 our journey exploring the Mani Peninsula. The journey back to Athens from the Peloponnese was much the same as the journey out, but this time with a brief stop off for lunch at what can only be described as one of the world’s quietest motorway services. I remember driving on motorways in Sweden was pretty pleasant because there were so few cars on the road, but where in the UK you stop a services and hear constant traffic whizzing past, here we stopped and it was silent. Eerily silent. Then once or twice you’d hear a car pass. And then more silence. I’d like to be the kind of traveller who only goes off the main roads to find lunch from a local eatery, enjoying their lunch in some scenic spot – maybe one day I will. But for now we still stop of motorway services, even abroad, and eat bog standard sandwiches. So here it is, I’ve finally reached the final instalment of our June trip to the Dordogne. If you’ve just arrived and would like to read from the beginning, click here for all the posts and just work from part 1 onwards. It wouldn’t have been right if we didn’t start our last day in the Dordogne with a visit to a market, after all we had been to a market every single day so far. 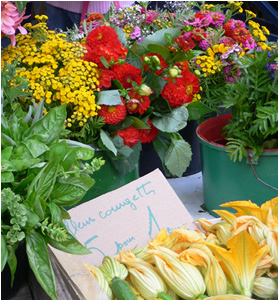 In our sights was the market at Riberac, and we weren’t disappointed. It was large and bustling, full of food producers and artists, as well as cheap T-shirts and bargain items. There were a lot of English people here, I even spotted a hessian shopping bag from our local grocery in Manchester where I shop every week – now that was odd. We came across our friendly gite owner Louise selling her goat’s cheese, not that I seem to have taken a picture of her stall. Look at those mushrooms – and every mushroom stall in the Dordogne seemed to be decorated with ferns. If you’re still following along with our travels in the Dordogne – thank you! You are very patient, but I do hope that you are enjoying it or gleaning some information if you are planning a trip there yourself. I find personal blogs one of the best ways to find information about a new place we are travelling to, they are so much more insightful that generic tourist websites. A leisurely morning was spent finishing up spelt sourdough bread spread with local honey, and picking up provisions from the market at Excideuil. This was a very good market, spread out along a long street and up to a square. And back to France we go – the next instalment of our summer holiday to the Dordogne (you can catch up on part one and two if you like). We had one proper day trip out, having done some research before we went away on places that looked nice to visit, we decided to head towards Sarlat. I’d heard there was a seriously good market here, and there were a couple of little places along the river that looked nice, so we filled our bellies with sourdough spelt bread spread with honey and strawberries and off we went. The market at Sarlat did not disappoint. It was incredible! I always worry “are we going to find the market?” when we head somewhere new, but you couldn’t miss Sarlat market, even if you weren’t looking for it, you would stumble across it on a wander around the town. It goes on and on down the narrow winding streets, tumbling out into squares. Every single morning during the holiday we went to a market to buy ingredients for our meals that day. I know this is probably unsustainable for real everyday life, but gosh I loved it. I didn’t have to meal plan ahead, I didn’t ever once write a shopping list, we just turned up and made up dinner based on what we fancied. As you will see the first few days of our holiday the weather was minging – so much rain and grey skies! This (above) was the little market in nearby Chateau l’Eveque, about 3 or 4 stalls, we went to the veg man and bought amongst other things some incredible wrinkly tomatoes (sorry no pictures – was trying to avoid getting soaked – lots more food pictures to come later though I promise! ), a punnet of fragrant strawberries and a melon. I’m not a melon fan, but in France I adore melons they are so much tastier – our experience in the Loire was when you went to buy a melon from a market stall they would ask you if it was to eat today or later, and find you the best one. We also went to the bakery for breakfast and got croissants (for me) and pain au chocolat (for Mr Rigg) – these rated quite highly in the taste test. We determined to find out the best bakery in the area for breakfast goodies and we found our favourite – details below. There are some fantastic Christmas markets in Manchester at the moment, full of delicious foods. From Raclette melted over new potatoes and gerkins, to spaetzle and paella there are all kinds of goodies. One of my favourite things at the Christmas markets is Flammkuchen – a German style pizza topped with a creamy sauce, bacon and onion. When I cook so much at home, it always feels quite expensive to eat at the markets. So instead we decided to give it a go at home. I went in search for a recipe – mind you, it took me a while to get the spelling correct! I was inspired by this recipe because it used quark – an ingredient I’ve seen before but never known what to do with it. Here was the perfect opportunity to quell my interest – turns out it’s like cottage cheese without the lumps. Quite nice! Roll out the pizza dough as thin as you can. Finely slice the onion – the thinner the better as the onion isn’t pre-cooked. I used pancetta rather than bacon and sliced it into lardons. In a bowl mix equal amounts of creme fraiche, sour cream and quark. Spread the creme fraiche mixture over the pizza dough, top with sliced onion and bacon before popping it into the oven for about 10-15 minutes or until it’s golden. All it needs before eating is a good grind of black pepper…or not if your Mr Rigg. Any other suggestions on what to do with the remaining quark would be graciously received! I love food and especially food that comes from distinct places – food that is specific to a place and shaped by the landscape. I hope that Eat the Earth will be an outlet to share the fantastic food that is local to me, and local to other places that I visit. I will also share the food and recipes I like to cook, especially with homegrown goodies. I love food, especially locally grown and seasonal food. This is my place to share my food finds and the food I like to eat. Natalie on Crumpets – how do you eat yours?